As much as a love a good soak in the bath, I truly love a long hot shower and I have found a new sensuous shower companion; the Champneys Spa Indulgence Exotic Retreat Shower Cream. This shower cream from Champneys Exotic Retreat range contains coconut milk and mango butter cleansers that leave my skin soft to touch and moisturised. It lathers up nicely with my trusty body buff and has a very light, soft spa like fragrance that lingers on the skin for a couple of hours. This inexpensive fragrance featured here on British Beauty Addict back in 2013 and it’s been my top choice of fragrance since I repurchase it at the beginning of May. The scent is sultry and described as ‘oritental, with a blend of bergamot, vanilla, caramel, musk and sandalwood’. If you’re off to shop anytime soon, pop into Zara and check out their fragrances, they do not disappoint, or break the bank. This lip gloss from Benefit gives my Clarins Instant Light Lip Perfector a run for its money. The colour is a pretty natural bronzy pink, with a slight gold shimmer. But the formula makes this lip gloss a pleasure to wear. It’s seriously smooth, comfortable, sheer, non-sticky, lip enhancing and hydrating, all whilst delivering a high-shine. Sorry Clarins, but you've been de-throned. Scrap your current hair oil/treatment/leave in conditioner; this award-winning hair oil from Moroccanoil is all you need. It’s like magic. I run a small amount through my damp hair and the light treatment gets to work, controlling fizz, detangling, protecting and leaves my hair feeling silky, soft, like it’s been blow dried. 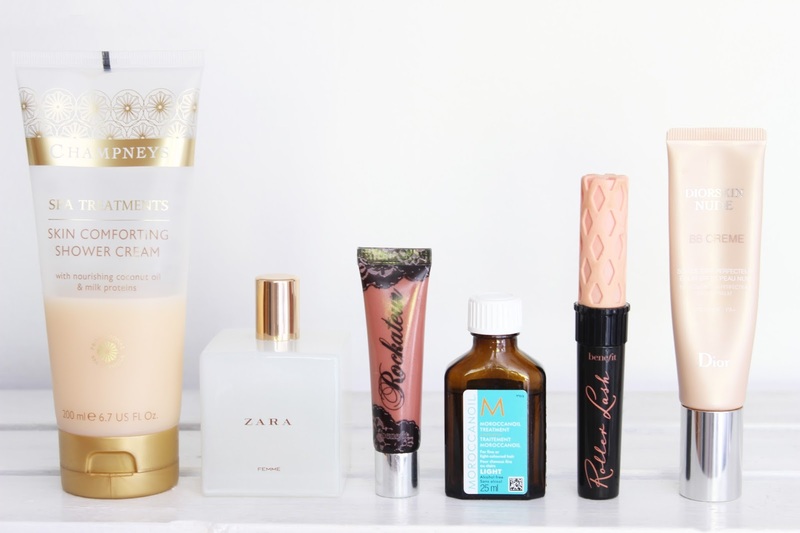 Definitely one to add to your shopping list, if not your holiday beauty-packing list! You can read my full review here. If you like pricer mascaras, Benefit’s Roller Lash Mascara is one to try. You only need a couple of coats to achieve separated, defined, lifted and super long lashes and although it is very similar to my coveted SEVENTEEN Doll’d Up Mascara, the lasting power and hold of Roller Lash sets it apart from the rest. You can read my full review here. Low SPF rating aside, this BB cream has been great for my combination, dehydrated skin. The lightweight, liquid texture glides onto my skin, leaving it looking fresh and more even in a matter of seconds. It’s a great base for a no makeup, makeup look and has become a staple in my daily makeup routine. You can read my full review here.